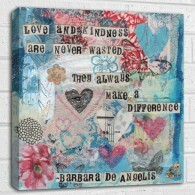 Fabulous canvas print from an original mixed media painting by artist Kim Anderson. 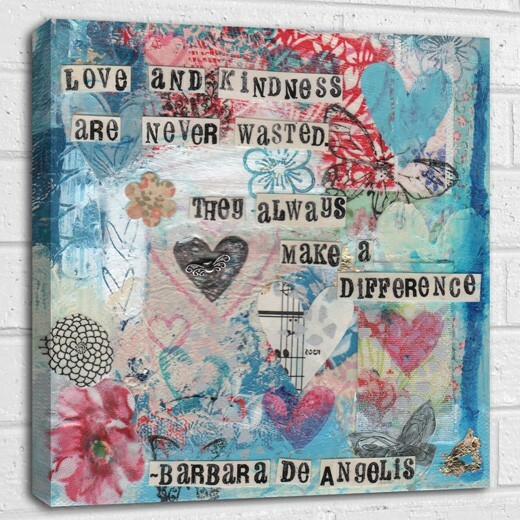 Love and Kindness are never wasted they always make a difference Barbara de Angelis quote canvas Fabulous canvas print from an original mixed media painting by artist Kim Anderson. Size 30 x 30cm. Our canvas art are printed on 380gsm cotton canvas with the photo printed high resolution giclée using Ultrachrom inks, which will look vibrant for years to come. We then carefully mount them onto solid wood, chunky 38mm frames which are taped at the back so no staples are visible. We also coat them with a protective coating to give a beautiful finished piece of Canvas Art that won't fade or crack on the corners.